With the Bafang mid-mounted motors, a new category has been added to the range of electric bicycle motors for retrofitting. In addition to hub motors, bottom bracket motors are now also available for all conversions to pedelecs. Since the motor is not mounted in the hub, all bikes can keep their built-in gears and brakes. Whether Rohloff, NuVinci, hub dynamo or roller brake, with the Bafang mid-engine you don't have to do without anything anymore. Since the freewheel is located on the crank, the only downer is the omission of the pedal brake. But the mid-engines can make up for this with their low centre of gravity: thanks to this ideal weight distribution and better ground contact, a bicycle converted with the Bafang mid-engine is not only pleasantly natural, but also particularly safe. For our pedelec middle motors we use the Bafang BBS01 middle motor with 250W, 36V and 15A maximum current. The best performance is achieved in a cadence range of approx. 60-70, or in other words, at an average city speed. Therefore it is especially suitable for everyday use in the city and its surroundings. The Bafang mid-engine can also cope with inclines, but more power is required. 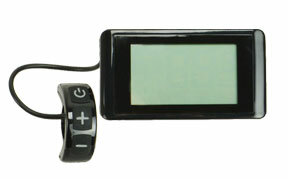 The mid-engine conversion kit is supplied with an LCD display and a three-button control element. The large display panel informs about all important driving data like speed, support level, driving distance, battery status and time. The backlight can be switched on at night or in bad weather. The pushing aid can be activated with the control element if required. This allows the electric bicycle to travel up to 6km/h without having to pedal. 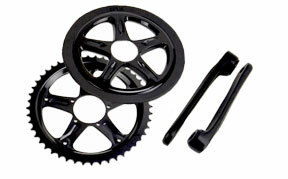 The conversion kit includes cranks and chain wheels with a matching plastic protective ring. All Ebike Solutions mid-mounted engine conversion kits come with a 44-speed chainring. At the time of purchase you have the option of exchanging the 44 ring for a 46, 48 or 52 chainring. In this way you can design the translation entirely according to your ideas. One of the advantages of the mid-engine conversion kit is its sleek look: Since the controller and pedal sensor are not supplied as individual parts, the entire retrofit kit consists of far fewer components than sets with hub motors. Since there are much fewer cables to install on the frame, you save a lot of time when retrofitting. All Bafang mid-mounted motors have the controller in the motor housing and the pedal sensor in the motor axle. More accessories such as tools, chains, extension cables and batteries can be found at the bottom of this page. Click on the image to see the dimensions. The installation of the mid-engine is most straightforward when the following conditions are met. Attention: For technical reasons carbon frames should not be retrofitted with a mid-engine. The following table contains all technical details as well as the lengths of the cables included in the conversion kit. The exact dimensions of the BBS01 mid-mounted motor can be found in the dimension drawings below the table. Click on the picture to see the dimensions. If the frame and the bottom bracket are suitable for mounting the mid-engine, with the right tools the Bafang engine can be mounted quickly and easily on the bike. Here you can use our BBS01 / BBS02 Tool set. We offer it either for purchase or rental. With these tools you fasten the M33 nuts of the center motor. You will also need a 4, 5 and 10 mm Allen key and a Phillips screwdriver. If available, the TL-FC32 bottom bracket wrench and LF-0300 locking ring wrench can also be used to loosen the M33 nuts. Since the mid-engine is built into the bottom bracket, you also need the right tool to disassemble it. We have put together various mounting kits for purchase or rental, each suitable for an Octalink-, square- or Hollowtech II-bottom bracket. If you do not need a set, we also offer all tools individually for purchase. Due to its installation in the bottom bracket, the Bafang mid-mounted motor has several advantages over hub motors. Since many components are already installed in the motor housing, conversion with a mid-mounted motor is faster and easier than retrofitting with other motors. At the same time, this ensures a clean, tidy appearance because fewer foreign parts have to be attached to the bicycle. The original wheel can also be reused and does not have to be replaced by one with a stored motor. In contrast to all other rear derailleurs, the mid-engine can be combined with all gears, such as hub gears and Rohloff gears. In addition, there is no need to do without a hub dynamo. This makes the Bafang mid-engine not only extremely flexible, but also requires very few modifications to the bike. The installation in the bottom bracket also has advantages for the riding behaviour: due to the central, low centre of gravity, the electric bikes with Bafang mid-mounted motors have a better weight distribution and a stronger grip. This means that the electric bike continues to move and steer in the same way as a conventional bicycle. In addition to all these advantages, there are two limitations to consider when choosing a mid-engine. On the one hand, the engine has only one chainring, which means that the variety of ratios is limited. On the other hand, a pedal brake must be dispensed with. The Bafang mid-mounted motor is suitable for all e-Mountainbikes. The installation in the bottom bracket provides the ideal weight distribution for jumps, trails, descents and trekking. In contrast to a hub motor, the mass of the Bafang mid-mounted motor is also sprung, as it is attached directly to the frame. This way it is better protected from shocks caused by bumps and rides over roots. For e-MTB, batteries that can be attached to the frame triangle or carried in the backpack are particularly recommended. This combination at least influences the MTB's performance. However, the mid-engine is not as high-torque as our hub motors. After the conversion with a mid-engine , your mountain bike has only one chainring. More information about the latest MTB can be found on our e-mountainbike-page.